Leena Madan (front row, center) has been named a finalist for the Visionary Award presented by the Columbus chapter of the National Association of Women Business Owners. 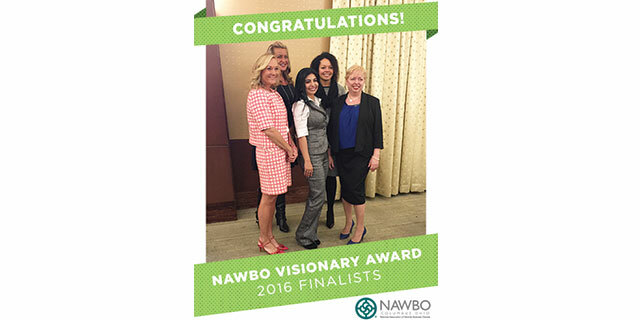 Leena Madan, Chief Operating Officer of geoAMPS, has been named a finalist for the National Association of Women Business Owners (NAWBO) Columbus 2016 Visionary Award. Each year, the Columbus NAWBO chapter names finalists and presents the Visionary Award to a Columbus-area business owner who has achieved success with her business while making notable contributions to her community and industry, and for her initiatives on behalf of other women in business. The Columbus NAWBO chapter presents this prestigious award to recognize and showcase successful women who not only own and operate businesses that are vital to Ohio’s economy, but also devote time and resources to identify needs and drive social change. Leena and other Visionary Award candidates were nominated by their peers. The finalists will be recognized at the Visionary Awards Gala on July 29, when the Visionary Award will be announced. In addition to the honor from the NAWBO Columbus chapter, Leena has received Most Influential Woman of Ohio and Glass Ceiling awards from the National Diversity Council. geoAMPS is the premier provider of software solutions to manage land rights and infrastructure assets. Founded in 2011with one software product to serve the right-of-way industry, Leena led the expansion of the product line to encompass project, land rights and infrastructure asset management needs. Today, there is a separate software product to serve right of way, oil and natural gas, alternative energy, land reclamation, road transportation, rail transportation, survey, telecommunications, government, and document management industries. There also is a separate geographic information system (GIS) viewer. geoAMPS standardizes and automates processes through a proven software solution. Through Leena’s leadership, geoAMPS products became available across Web, mobile, offline/detached and GIS technology platforms for optimal flexibility and deployment. geoAMPS has experienced rapid, dramatic growth. As majority owner and Chief Operating Officer, Leena plays a critical role in the daily operation and growth of geoAMPS, now in its fifth year. Her market expertise, and leadership and guidance of all geoAMPS departments and its Leadership Team, have positioned geoAMPS as the go-to software vendor for managing land rights. geoAMPS competes successfully with companies that have been in business for more than 40 years. Its success rate is unprecedented within the industry in terms of gaining new customers, product comprehensiveness, revenue growth and speed of product and service deployments. Leena’s commitment resulted in establishing geoAMPS’ reputation for high quality of products and services. The company is revolutionizing industries by leveraging Web, offline/detached, mobile and GIS technologies within the land rights, infrastructure assets and data management markets. geoAMPS offers the most comprehensive suite of software products and services in the marketplace. Her vision to introduce mobile technology to replace predominantly paper-based processes in the land services industry positioned geoAMPS well ahead of the competition. She led efforts to expand geoAMPS’ customer base into Canada when the company was in its infancy. She led the development of a company culture where hard work and commitment are rewarded, collaboration is embraced and having fun and practicing good health habits are encouraged. geoAMPS has received top honors in the Healthiest Employers of Central Ohio awards. Leena is a strong advocate of community outreach. She has committed company resources for a number of worthwhile causes and encouraged philanthropy among company employees. As a testament to her vision, she leads by example, getting involved in local charities, taking leadership roles, and contributing her time and money to help those less fortunate. Leena has been an active supporter of the Greater Ohio Region of the American Red Cross since 2012. geoAMPS sponsored the local Red Cross chapter’s leading fund-raising event three years. She currently serves on the local Red Cross chapter’s Advisory Board. In addition, she has supported Veterans of Foreign Wars Ohio Charities, Mid-Ohio Food Bank, Salvation Army Adopt-A-Family; Humane Society of Delaware County, Powell Area Chamber of Commerce, American Cancer Society, ALS Foundation, International Justice Mission and Asha Ray of Hope, an organization that addresses domestic violence. geoAMPS was named a finalist in the Corporate Caring Awards in Central Ohio.